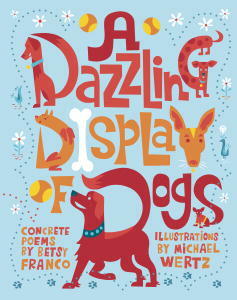 A Dazzling Display of Dogs is dazzling indeed! The book is comprised of non-linear poems that are set within bright illustrations. Michael Wertz’s graphic illustrations makes each poem sparkle and dance. Author Betsy Franco keeps her poems short but each captures the essence of the doggie moment. My favorite is “Found at the Pound,” which describes a family’s visit to the shelter, although who can resist “Emmett’s Ode to His Tennis Ball” or “Old Lottie on a Walk”? This is another great book of dog-related poetry that kids ages 4 and up will enjoy reading and looking at.